e.l.f. (eyes lips face) cosmetics is one of my favorite brands. They aren't new by any means, but I never really purchased anything from this brand before. This is definitely considered a drug store brand but in most cases, the products themselves remind you of something much more expensive. 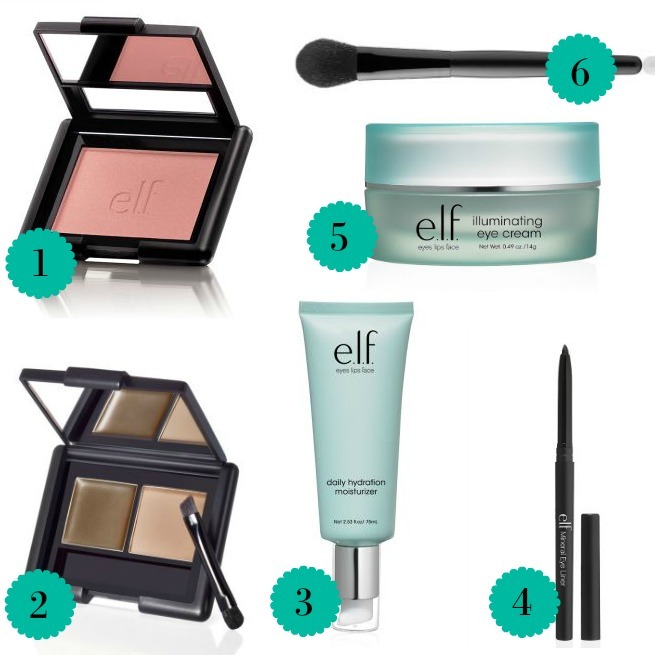 Beauty vloggers all over YouTube have been astonished at how well e.l.f. products do compared to high-end and pricey dupes. This isn't a sponsored post...I just really like e.l.f. and figured I'd share a few of my faves with the blogosphere. I'm a big fan of this blush. This particular shade is matte (no shimmer) and I love that. I've grown awa from bluish pinks to the warmer corally pinks which I think compliments my VERY fair skin much better and warms it up a bit. I've never really done much with my eyebrows since my hair is so light and sparse, but this brow cream and powder really help me emphasize my brows but the color isn't too dark for them. This is something I consistently struggle with is a true "blonde brow" cream/powder and this e.l.f. version matches very well! This stuff is the bomb diggety. (do the youngins still say that?) It's heavy enough for my dry winter skin but also lightweight enough for warm weather wear. It absorbs quickly, smells great, and very affordable. This is my third order of this moisturizer! This thing says it's "Mineral Eye Liner" but honestly idk what that really means. This eyeliner is nice and opaque and has legitimate staying power. The downside is it only comes in black. PLEASE MAKE MORE COLORS, e.l.f.!! For the price, you can't beat it! I've not been one to take care of my eyes and it's showing as I get older. So this illuminating eye cream is just creamy/thick enough to absorb but not so thin it absorbs in seconds. I have no idea if it is making my eyes illuminated, but it definitely moisturizes and keeps things "supple". HAHA. This is the best blush brush I've ever used, hands down. It deposits color evenly and well. And for the price point, it's a great deal! Have you tried any e.l.f. products? Do you have any faves? Please share!